This web page uses a simplified analysis to show that circulating static charge forms the external field energy density distribution required for the existence of a spheromak. The more elaborate mathematical proof of spheromak wall position stability is developed on the web page titled:THEORETICAL SPHEROMAK. The electric and magnetic fields of a spheromak maintain its toroidal geometry and to hold a stable amount of energy. A spheromak toroid has a major axis and a minor axis. The charge motion closed spiral path is characterized by Np turns around the toroid's major axis and by Nt turns around the toroid's minor axis. This charge motion path has the toroidal shape of the glaze on a doughnut and is referred to as the spheromak wall. Inside the spheromak wall the magnetic field is toroidal. Outside the spheromak wall the magnetic field is poloidal. Inside the spheromak wall the electric field is cylindrically radial. Outside the spheromak wall the electric field is spherically radial. The spacial distribution of the circulating charge is constant over time. Hence the electric and magnetic field geometry is constant over time. The spheromak field structure allows semi-stable plasma spheromaks and discrete stable atomic charged particles to exist and act as stores of energy. A plan view of the charge path of an elementary spheromak with Np = 3 and Nt = 4 is shown below. 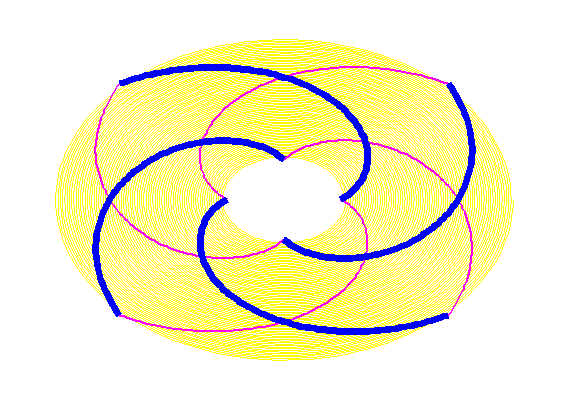 The blue lines show the charge path on the upper face of the torus. The red lines show the charge path on the lower face of the torus. Note that the charge path never intersects itself except at the point where the charge starts to retrace its previous path. In the diagram yellow shows the region of toroidal magnetic field. Outside the yellow region is a poloidal magnetic field and a spherical electric field. In a real stable charged particle typically Np = 222 and Nt = 305 so the numbers of charge path poloidal and toroidal turns is much greater in a real spheromak than is shown on this simple diagram. Top to bottom connection points were depicted by adjusting the torus Rs to 4045 and Rc to 1060. Atomic particle spheromaks consist of quantized charge that superficially appears to be at rest with respect to an inertial observer. Isolated stable atomic particles such as electrons and protons hold specific amounts of energy (rest mass). When these particles aggregate the assembly emits photons. This photon emission decreases the total amount of energy in the assembly creating a potential energy well. In an atomic particle spheromak current moves uniformly around a closed spiral path. The net charge motion is at the speed of light. The spheromak net charge is uniformly distributed along the charge path. The uniform charge distribution along the charge motion path and uniform charge motion cause constant electric and magnetic fields. The time until an element of charge retraces its previous path is (1 / Fh) where Fh is the characteristic frequency of the spheromak. 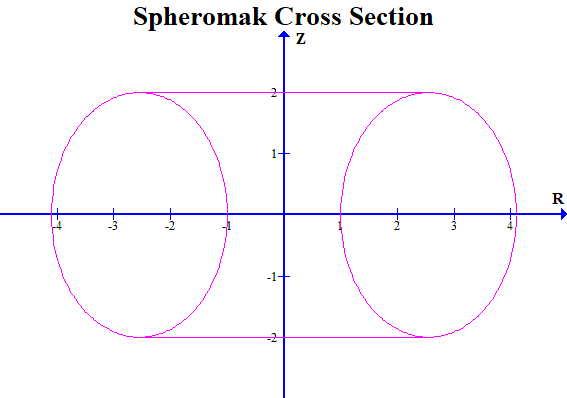 A spheromak in free space has a round cross section. However, the fields of an atomic particle spheromak may be distorted by external electric and magnetic fields. = 15.03275887 X 10^-11 J. = 81.87105146 X 10^-15 J. Plasma spheromaks are composed of free electrons and ions that move along a stable closed path at less than the speed of light. Plasma spheromaks can be generated and photographed in a laboratory. A plasma spheromak in free space has a nearly round cross section. However, in a laboratory the field configuration of a plasma spheromak is affected by the proximity of a metal enclosure containment wall. If the equatorial outside radius Rs of a spheromak approaches the inside radius Rw of an enclosure's cylindrical wall the spheromak loses stability because the external field energy distribution becomes cylindrical rather than spherical. The image below shows a plasma spheromak photograph made by General Fusion Inc.
(Rs / Rc) ~ 4.2. (Rs / Rc) = 4.1047. For plasma spheromak stability there must be a slight separation between the positive ion and negative electron paths to prevent inter-particle scattering. Further, to prevent further scattering and loss of energy from energetic plasma free electrons the concentration of neutral ionizable atoms in the vacuum chamber containing the spheromak must be very small. The amount of field energy trapped by a plasma spheromak can be significant. In the Plasma Impact Fusion (PIF) process the total field energy Ett of each injected plasma spheromak, above and beyond the total field energy of the plasma spheromaks constituant particles, must be at least: 3000 J. Conceptually a spheromak wall is a toroidal surface formed from the closed charge path of a spheromak. The direction of the charge path axis within the spheromaki wall conforms to the toroid surface curvature. The charge path forming a spheromak has both toroidal and poloidal magnetic field components. The charge path axis gradually changes direction over the surface of the toroid following a spiral. In a spheromak quantized positive and negative charge moves along a spiral path tangent to the spheromak wall. A spheromak is cylindrically symmetric about the spheromak major axis and is mirror symmetric about the spheromak's equatorial plane. The net charge Qs is uniformly distributed over the charge path length Lh. In the central core of the spheromak the electric field is zero. In the toroidal region enclosed by the spheromak wall the magnetic field is purely toroidal and the electric field is cylindrically radial. In the region outside the spheromak wall the magnetic field is purely poloidal. Outside the spheromak wall the electric field is spherically radial. The charge circulate in the narrow low magnetic field region at the interface between the toroidal and poloidal magnetic fields within the spheromak wall. Z = height above (or below) the spheromak equatorial plane. The following diagram shows the approximate cross sectional shape of a real spheromak within a cylindrical enclosure. At R = 0, Z = 0 the energy density is maximum. Note that a theoretical spheromak in free space is toroidal with an elliptical cross section whereas a real spheromak may be radially distorted by the proximity of metal enclosure walls. The subscript s refers to the spheromak outer "surface" on the equatorial plane. In order to understand the material on this web page it is essential for the reader to study the spheromak cross sectional diagram and to identify the above mentioned parameters. When a unit of charge has passed through the spheromak core hole Nt times it has also circled around the main axis of spheromak symmetry Np times, after which it reaches the point in its closed path where it originally started. So^2 = (Rs / Rc). The energy and frequency of a spheromak also involve Np and Nt. There are Nt parallel charge hoses that go through the equatorial plane in the central core of the spheromak and hence form the spheromak inner wall. The remainder of this web page is devoted to mathematical analysis of undistorted ideal spheromaks. Assume that the spheromak charge is uniformly distributed along the charge hose length. For Rc < R < Rs the toroidal magnetic field Btit is proportional to (1 / R). where dL is an element of the ring's circumferential length. Consider a point at distance "Z" along the ring axis, where Z = 0 on the ring plane. Note that at Z = 0 the net electric field is zero and the electric field energy density is zero. Thus for Z >> Ro along the ring axis the electric field energy density Ue is proportional to (1 / Z)^4. Consider a ring of radius "Ro" and an axial measurement point at distance "Z" from the current ring along the ring axis. (Theta) = angle between unit vector (R / |R|) and the ring axis. Thus for Z >> Ra the magnetic field energy density Um is proportional to (1 / Z)^6. Hence at large distances the magnetic field energy density becomes negligibly small as compared to the electric field energy density. Note that Umo is the magnetic field energy density at R = 0, H = 0 corresponding to current Ip circulating at R = Ro. The spacial geometry of a spheromak is more complicated than a thin charge and current ring. However, the above simple analysis gives an indication of the general form of a spheromak's energy density function outside the spheromak wall. The advantage of the above analysis is that it is simple. It is easy to get lost in the mathematical complexity of the detailed spheromak analysis. This web page last updated February 4, 2018.